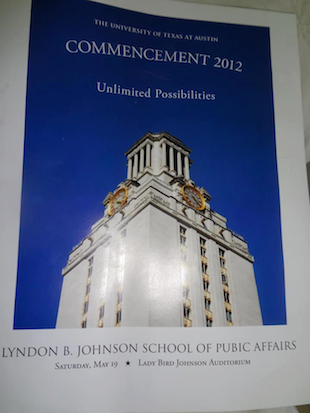 The University of Texas at Austin's public affairs assistant dean has issued an apology after a commencement listing for the program's forthcoming graduates contained a typo citing the Lyndon B. Johnson School of 'Pubic' Affairs. Even the best writers, reporters and editors fall prey to the occasional typo. And it's probably bad karma to revel in someone else's unintentional mistake. But media critic Jim Romenesko reports that the LBJ school issued an apology via Twitter, reading, "Our deepest apologies to our 2012 graduates for the egregious typo in our program. We are working to distribute corrected programs." Susan Binford, assistant dean for communications at the Lyndon B. Johnson School of Public Affairs, tells Romenesko that students will be issued new copies of the commencement program. "Obviously, we are mortified. It's beyond embarrassing," Binford said. "As soon as we realized the mistake [on Saturday], everybody went into overdrive and we went to work to reprint it." Still, it's interesting how much fuss the omission of one letter can lead to. No one was killed, no one lost their job and any concerned parties can rest assured that they will have a corrected commencement program to reflect upon in the future. But it's not going to stop the critics of the world from expressing their outrage at the fallibility of others. Though for most of us, it will probably be remembered with little more than a quick laugh. The image was first posted to Twitter by Texas Tribune editor Evan Smith.